The alleged intellectual property chapter of a secretive regional trade agreement between an association of ten Asian countries plus six others was released yesterday by a civil society group, which says richer countries in the region are pushing for stringent IP rules. The Regional Comprehensive Economic Partnership (RCEP) includes the ten member states of the Association of Southeast Asian Nations (ASEAN): Brunei, Burma (Myanmar), Cambodia, Indonesia, Laos, Malaysia, the Philippines, Singapore, Thailand, Vietnam, plus six other countries: Australia, China, India, Japan, South Korea and New Zealand (IPW, Public Health, 24 June 2015). Knowledge Ecology International released the alleged October 2015 IP chapter yesterday. The released document contains indications of countries’ opinions. For example, Japan, seemed to have opposed the following language: Alt 1: Each Party shall be free to establish its own regime for exhaustion of intellectual property rights, but proposed instead: Nothing in this Chapter addresses the issue of the exhaustion of the intellectual property rights. 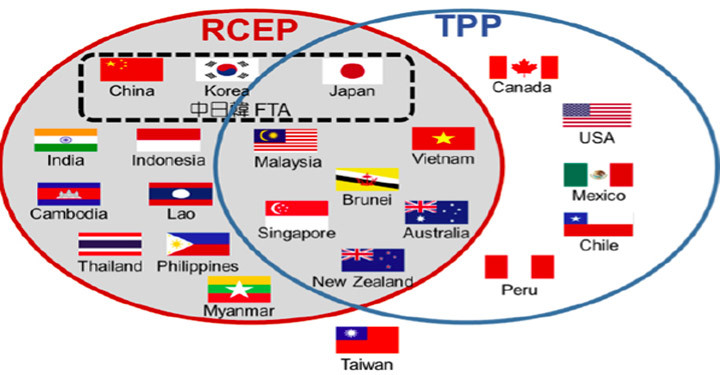 The RCEP IP chapter “will bind India and China, two countries left out of the TPP. Japan and Korea are trying to push many of the worst ideas from ACTA [Anti-Counterfeiting Trade Agreement], TPP [Trans-Pacific Partnership] and other trade agreements into the RCEP IP Chapter,” KEI President James Love said in a statement. “Some of the issues that negotiators did not understand in the TPP, such as the damages provisions, are also lurking in this text, creating risks that negotiators will do worse than they think, because the secrecy of the negotiations insulates the negotiators from timely feedback on technically complex issues,” he said. Among particular issues with the chapter are proposals for patent extensions, restrictive rules on exceptions to copyrights, and “anti-consumer measures,” according to KEI. This illustrates “the power of right-holder groups to use secret trade negotiations to limit democratic decisions that impact access to knowledge, the freedom to innovate and the right to health in negative ways,” the group said. Médecins Sans Frontières (MSF, Doctors Without Borders) in a press release today said the RCEP could “severely restrict” access to affordable medicines for millions of people around the world under its current proposals regarding the introduction of IP measures “far tougher on access to medicines than what is required under international trade rules,” such as data exclusivity. According to MSF, the next round of the RCEP negotiations are starting in Perth, Australia, on 22 April. In a related development, MSF and 50 other organisations has issued a letter urging the rejection of the TPP agreement on public health grounds. [Update:] Looking to this week’s round of RCEP talks, the India-based Forum Against FTAs issued a press release raising concern for developing countries about aspects of the RCEP: lack of public disclosure, access to medicines, investor rights, and biopiracy/biodiversity issues. "Leaked IP Chapter Of Asian FTA Reveals Tough Rules For Poorer Partners, Civil Society Says" by Intellectual Property Watch is licensed under a Creative Commons Attribution-NonCommercial-ShareAlike 4.0 International License.